LUIS SUÁREZ might have been in tears on Monday night but he ended Tuesday night all smiles after picking up a hat-trick of awards at Liverpool FC’s inaugural Players’ Awards Dinner in the city centre. 24 hours earlier the league’s top scorer had been visibly upset after his side had let a 3-0 lead turn into a 3-3 draw, the club’s fading hopes of the title seemingly all but gone. As he and his team mates arrived at the ceremony there was barely a smile to be seen, and even then only the kind of smiles photographers force out of people stood outside a wedding reception when they’d rather be inside at the bar. As the night went on a feeling of doom lifted as more and more voices pointed out that “it” was only a little bit less “on” than it was before that game against Crystal Palace, if you think about it. It wasn’t just the drink talking. Fantasy scorelines aside, City needed to drop points in their last two games if the Reds were going to win the league, a fact that remains even now, albeit three points rather than two. 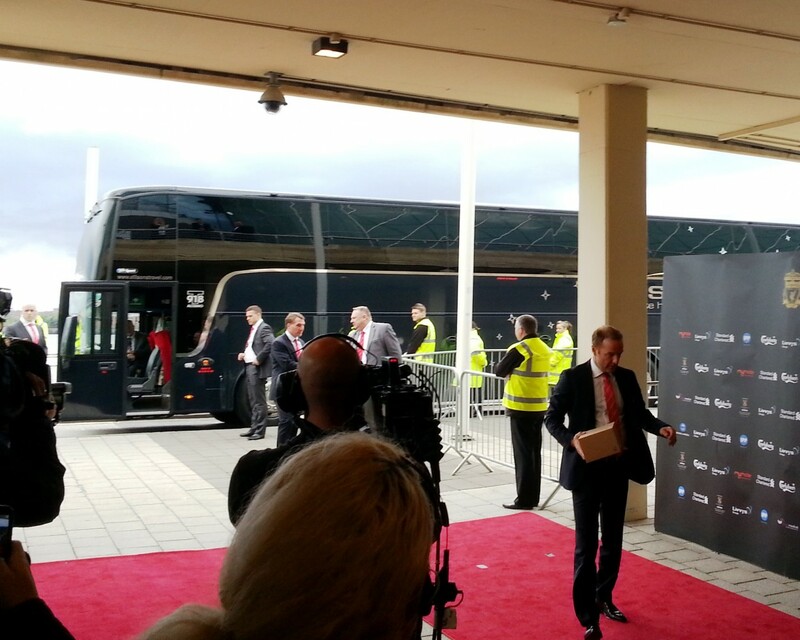 The last time I saw Liverpool’s team bus it was through a haze of pyro in a sea of banners on Anfield Road. Last night it arrived almost unnoticed at the back door of the ACC or whatever that other end of the Echo Arena is called. Round the front of the building another door was letting X Factor contestants in and out, as good a reason as any to try and stay round the back. Either that show’s going to take a huge ratings dip this year or this wasn’t the day they pretend normal people can just turn up and queue up for an audition. The group that gets the Christmas number one could have been walking out of that door but the only group we were interested in was Brendan’s and they were more or less the last to arrive. The first to arrive had been Joss Stone, who had shoes on. She didn’t stop to speak, but it turns out her dad’s a massive Red which in turn means she is too. I obviously wouldn’t brainwash my own daughters into supporting Liverpool. Of course not. Not that you have to anyway, although Johnny Ball should have tried harder with his. TV chef Simon Rimmer was one of the guests – without Tim Lovejoy – but in a sign of what some people will say demonstrates all that is wrong with football the chef kept two legendary European Cup winning Red full-backs waiting as he chatted to the club’s TV channel. It just didn’t seem appropriate for Alan Kennedy and Phil Neal to be left waiting patiently on the red carpet for their turn as Mr Rimmer discussed his tips on getting a lemon meringue just right. This club has a lot of celebrity fans, even if many of them weren’t there last night. Maybe Daniel Craig could have kept those boys waiting – maybe – but Simon Rimmer? Sorry Si. At least it wasn’t DJ Spoony. The DJ, he used to be on Radio 1 but Wikipedia doesn’t really say what he does these days, didn’t hold anyone up. He did hold Colin Murray’s can of Red Bull though, the Northern Irishman clearly in need of an energy boost ahead of hosting the awards with Sky’s Natalie Sawyer. 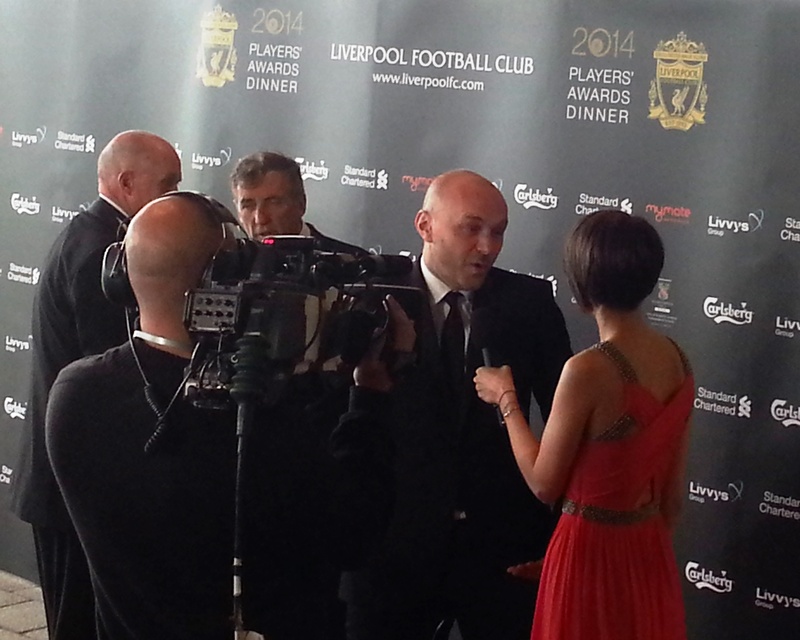 Other legends – LFC legends – there on the night included Didi and Dizzy. Didi Hamman stopped to speak to some of the media, Gary “Dizzy” Gillespie just wanted to have his photo taken and get in. He still had to speak to LFC TV though. Ian Callaghan, the man who still holds the LFC appearance record and is quite possibly the nicest Liverpool legend going, came over and told us that there was still time for a twist and turn in this mad league season. He probably didn’t called it a mad league season but that’s what he meant. As far as he was concerned it’s still on and he’s right. At the time of writing. Jason McAteer was last to arrive – probably went to the Town Hall first, his former team mates would say – but was happy to give up more of his time to chat. He also thinks it’s still on, and not only that but that Liverpool have set themselves up for more seasons like this one. Legend of the night probably goes to Ronnie Moran, the 80-year-old former club captain, coach and bootroom boy who still makes regular visits to Melwood. He picked up a lifetime achievement award. At the other end of the age scale came The Academy boys, looking resplendent, if maybe a little uncomfortable, in their suits and Kris Peterson got the job of doing the interviews. He was gutted about Tranmere going down, he said, and added that he’d made a lot of good friends during his loan spell, becoming something of a fan and making an effort to get to games even after his loan spell was over. He says they’ll bounce straight back. Matt Beard, manager of LFC Ladies, the league champions, arrived with his team and told us he was happy with the start to their new season, disappointment in the cup aside. Whilst the English game is now a summer season, the Champions League for the ladies doesn’t begin until September but he was quite comfortable with the idea of an extended season. Imagine trying to get his counterparts in the male game to be so understanding. Before the ceremony got going properly the Liverpool team were introduced in pairs to the audience sitting in the big hall. From an adjoining room we saw player after player line up on stage without smiling, at least until fans’ Young Player of the Year Raheem Sterling came on and laughed as he tried to work out where he was meant to stand. The last pair were the league’s top scorers, the SAS, Suárez and Sturridge. Suárez had a fixed, serious expression on his face, then someone said something and he burst into a massive, broad grin. That was the massive broad grin that this whole season has been. 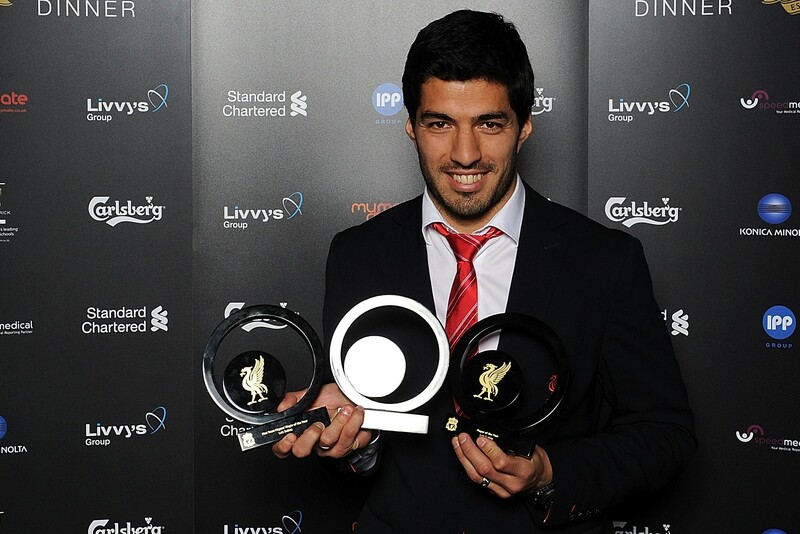 Suárez won three awards, including Goal of the Season for his first goal against Norwich (rather than his third, which was surely better). He also picked up two Player of the Year awards, one voted for by fans, one by his team mates, to go alongside the ones he got nationally from players and football writers. He’ll probably use some of these awards as goal posts in the front room when he’s having a kickabout with his kids. I was still down after the Palace game until I read this. Thanks Jim, you just reminded me what it’s all about, why we have such a fantastic club to support, and what a monumental season we have had despite a paper-thin squad.